Astronomical timer is used for switching on and off the lightning or other electrical receivers in accordance to sunset and sunrise with an option to program a night break, which means a temporary switching off of the receivers for savings purposes. With a programmable night break. The ability to wirelessly read and write control timer configuration via Android phone equipped with NFC communication. Night break, which means a temporary switching off of the receivers for savings purposes, can be programmed between the programmatic points of switching. AUTOMATIC MODE - automatic operation by programmatic points of contact switching [highlighted icon on the left side of the display]. In semi-automatic mode the contact position is opposite to that which results from the program cycle (which means that the contact is opened at night and closed during the day). Semi-automatic operation works only until the end of the current cycle of automatic operation, for example entering semi-automatic mode during the day will turn on the lights until the time of the scheduled switch resulting from the astronomic cycle. Then, the clock returns to automatic operation (and the light is still switched on until dawn). Mode switching is done using the +/- buttons on the main level. MANUAL MODE - [ON] permanently closed contact (position 1-5) or [OFF] permanently open contact (position 1-6) when the AUTOMATIC MODE is off [no icon on the left side of the display]. ASTRONOMICAL SUNRISE AND SUNSET - moments when the center of the solar disk touches the horizon (parameter h= -0.583°). Due to the simplification of calculations, the deviation of a few minutes in relation to data designated by „HM Nautical Almanac Office” is acceptable. The advantage of setting the point of switch on/off as a function of the position of the sun disk is that this feature is immune to change of the duration of the dusk/dawn for the different seasons of the year, so that the switch on/off occurs always for the same level of brightness. CIVIL TWILIGHT AND DAWN - including the calendar - the phase of the sunset, in which the center of the solar disk will be no more than 6 angular degrees below the horizon (solar disk viewed from Earth has a diameter of approximately half a degree). During this time brightest stars and planets („Evening star”, „first star” on Christmas Eve) appear in the sky (with good air clarity). Due to the scattering of light in the atmosphere there is still generally sufficient sunlight for normal operation in the open space without artificial light sources. Civil dawn (and calendar) - the time before sunrise, when the center of the solar disk is already higher than 6° below the horizon line. SCHEDULED POINT OF SWITCH ON/OFF - times of contact switching on (position 1-5) and off (position 1-6) determined based on the selected control option: astronomical sunrise/sunset or civil twilight/dusk and location. NIGHT BREAK - user-settable temporary switching between the program points of switching on and off. CONFIGURATION - designation of the LOCATION and setting the SCHEDULED POINTS OF SWITCH ON/. LOCATION - the geographical coordinates and time zone of a place relatively close to the place of the timer installation. Locations and time zones of approx. 1500 cities from 51 countries of the world are defined in the memory of the device. You can enter your personal settings as geographical location and time zone (UTC). COORDINATE CODE - geographical coordinates assigned for specified cities to help provide the location (cities and their associated codes are shown in the table). ± 180 min. - time correction for the point of switching as a shift of time relative to sunrise/sunset. DST - Daylight Saving Time - international name of summer time (free translation: the sunlight acquisition time). Disables automatic time changes. AUTOMATIC TIME CHANGE - change from winter to summer time. It can be set to work with or without automatic change. The controller is equipped with a function to select the time zone so that the switching time is consistent with the local time. DATE PREVIEW - preview of the set date (OK). PREVIEW OF THE SCHEDULED POINT OF SWITCH ON/OFF and LOCATION - the ability to view the current time of switch the contact open and close and the set locations (geographic coordinates are displayed) and the UTC time zone (subsequent pressing of the +/- buttons in the date preview mode). NFC WIRELESS COMMUNICATION - wirelessly read and write timer configuration from an Android phone equipped with the NFC module. 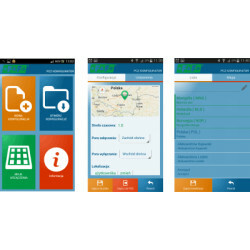 PCZ Configurator APP - free application for Android mobile phones and tablets equipped with the NFC module for wireless communication. The app is available on Google Play! CLOCK TIME CORRECTION - set monthly adjustment of the seconds of the system clock. 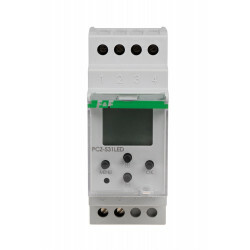 BATTERY INDICATOR - the controller comes with built-in control system of the backup timer battery used in case of main power supply failure. If the battery is low, user will receive information that the battery needs to be replaced. LCD BRIGHTNESS ADJUSTMENT - change the contrast of the display to get a clear LCD read-out from different viewing angles. RELAY STATE MEMORY - the relay state in manual mode will be remembered even after power supply failure. 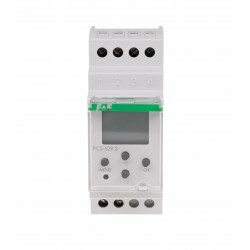 Currently sold clock is PCZ-525 series 3. This is an index indicating the version of the software clock. Check what version of software is your clock, and download the appropriate instructions. Due to the operating characteristics of the NFC module, it is not recommended to mount the clock near devices that emit electromagnetic fields (eg transformers, contactors). 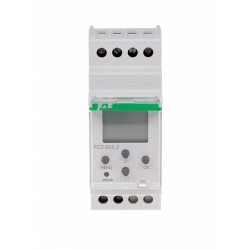 Currently, the PCZ-525 clock with index 3 (PCZ-525.3) is sold. It is an index denoting the version of the clock software. Check what software version your clock has and download the appropriate manual. Astronomical clocks work on the basis of information about the current date, geographic coordinates of the place where it is installed, and automatically determine the daily, programmable points of switching on and off the lighting. In astronomical clusters, it is not possible to "manually" program the on and off times (determine the user's own on / off points). User-adjustable time-out switching off between the switching points and switching off points. Used to turn off the lighting between the hours set by the user in such a way that the light turns on from the sunset point to the set off time by the user, as well as from the set switching on time to the sunrise point.